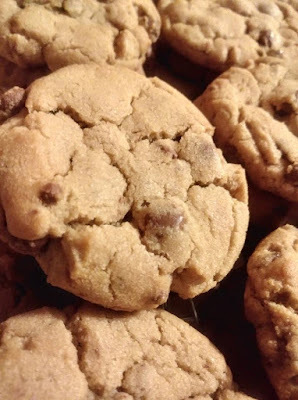 I have been under the weather so my husband took over and made his favorite cookie which is Chocolate Chip cookies with Milk Chocolate Chips. I tell him all of the time he needs to enter a contest. He really just follows the directions but he must just put in extra love because his cookies always come out different then any other cookie I have had from anyone else even from myself when I make the cookies from the batter he has made. It just doesn't make any sense. So here is the recipe he follows from the back of the package. The only difference he says he does is that he pats each cookie down with what we call his big sausage fingers. So maybe that is the secret. 1. Beat butter, granulate sugar, brown sugar, and vanilla until creamy. Add eggs continue to beat. 2. In separate bowl mix together flour, baking soda, and salt. 5. drop by teaspoon onto silicone lined cookie sheets and bake for 10 minutes for a crunchy cookie 8 minutes for chewy cookie.